14K Gold Overlay Sterling Silver Chinese Peridot Ring Size O 1.250 Ct.
ARTISAN CRAFTED Sterling Silver Peridot Crystal Quartz Triplet Ring 3.64 Ct.
ARTISAN CRAFTED Sterling Silver Peridot Crystal Quartz Triplet Ring 4.72 Ct.
Sterling Silver Chinese Peridot Ring Size O 2.500 Ct.
Chinese Peridot (0.90 Ct),Cubic Zirconia Ring (Size O) Brass W Brass 3.400 Ct.
KARIS Chinese Peridot (1.00 Ct),White Topaz Gold Bond Brass Ring 3.646 Ct.
Chinese Peridot (1.50 Ct) 14K Gold Overlay Sterling Silver Ring (Size P) 1.500 Ct.
KARIS Chinese Peridot (2.25 Ct),Simulated Diamond Gold Bond Brass Ring 2.900 Ct.
KARIS Sky Blue Topaz (2.66 Ct), Amethyst, Garnet, Peridot, Citrine Gold Bond Ring 8.025 Ct.
KARIS Red Coated Quartz (4.75 Ct),Chinese Peridot Platinum Bond Brass Ring 6.650 Ct.
KARIS Chinese Peridot (3.75 Ct),White Topaz Platinum Bond Brass Ring (Size O) 3.806 Ct. Coated Mystic Topaz (1.05 Ct),Chinese Peridot Platinum Overlay Sterling Silver Ring 1.100 Ct. Coated Mystic Topaz (1.15 Ct),Chinese Peridot Platinum Overlay Sterling Silver Ring 1.650 Ct.
Sterling Silver Brazilian Green Amethyst,Chinese Peridot Ring Size O 5.250 Ct.
Sterling Silver Chinese Peridot and Diamond Ring Size O 1.460 Ct. Coated Mystic Topaz (1.00 Ct),Chinese Peridot,White Topaz Platinum Overlay Sterling Silver Ring 1.200 Ct.
Sterling Silver Chinese Peridot,White Topaz Ring 3.05 Ct.
Sterling Silver Chinese Peridot,White Topaz Ring 3.80 Ct. Platinum Overlay Sterling Silver Rose De France Amethyst ,Chinese Peridot,White Topaz Ring Size O 3.000 Ct.
Indian Garnet (0.93 Ct),Fire Opal,Chinese Peridot Sterling Silver Ring (Size M) 1.860 Ct. Choose pretty peridot rings to wear this summer. Gleaming with an olive green shimmer peridot rings are soft and gentle, stunning rings perfect for a summer’s day. Peridot rings, white gold peridot and diamond rings, yellow gold peridot rings are available to buy online at Rings.org.uk. Tempted by the subtle glow of peridot, diamonds and gold you must consider choosing these precious rings for yourself and as gifts for friends and family. Peridot is a pale green gemstone with a hint of yellow. Lighter than emerald rings your peridot rings are the perfect summer accessory you’ll love wearing every day. Peridot engagement rings are beautiful rings to offer your girlfriend or partner. Gold diamond and peridot engagement rings represent the past, present and future of your relationship. Diamonds enhance peridot and diamond peridot rings sparkle with the essence of morning dew on freshly cut grass. Pearl and peridot rings are also popular as the natural essence of pearl complements peridot’s enchanting beauty. Peridot rings are the perfect gift for people born under the Leo star sign or in the month of August. Peridot is the August birthstone known for attracting good luck, peace and prosperity. Wearing peridot rings inspires peace and calm and peridot rings symbolise happiness and longevity within your relationship. White gold diamond and peridot rings make beautiful anniversary gifts. Suitable for any anniversary, peridot is the nominated gemstone for celebrating your 16th wedding anniversary, birthday or even simply the relationship milestone with your partner. A true summer colour peridot brings joy and happiness. 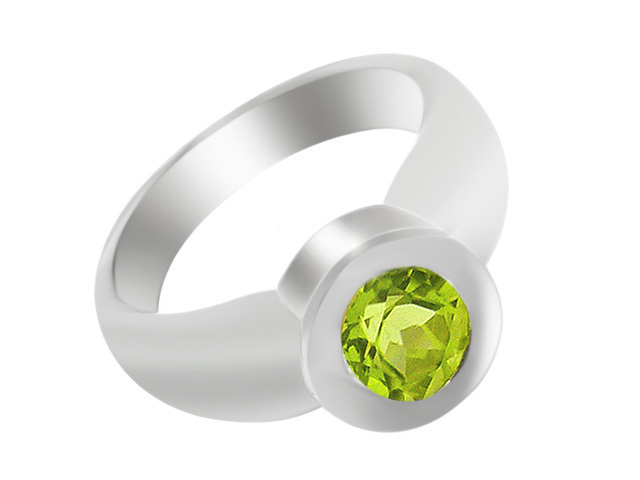 Choose your peridot rings at Rings.org.uk and you’ll discover beautiful rings you’ll love to wear.